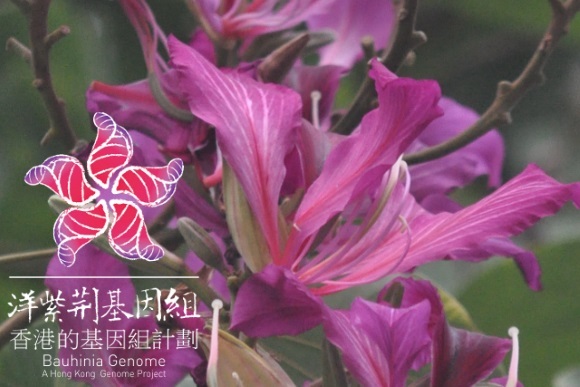 GigaDB Dataset - DOI 10.5524/100345 - Transcriptome assemblies of three Bauhinia species. Transcriptome assemblies of three Bauhinia species. Bauhinia blakeana Dunn commonly known as the Hong Kong Orchid Tree, was adopted as the city flower of Hong Kong in 1965 and became the official emblem of the Hong Kong Special Administrative Region (HKSAR) in 1997. It was first discovered in the 1880s and is now planted all over the territory. It has long been suspected that Bauhinia blakeana is the sterile hybrid of two related species, B. purpurea and B. variegata, although limited genetic information of this plant has been available to confirm this. In this study utilizing crowdfunded data from the Bauhinia Genome project, unigenes of B. blakeana (94,755), B. purpurea (111,976) and B. variegata (81,757) were obtained after de novo transcriptome assembly of the three species’ leaves. We also pooled the reads of flowers and leaves from B. blakeana, resulting in 123,668 clusters. Data from mapping reads of the tested species to chloroplast sequences demonstrates that B. purpurea is the maternal parent. Differential expressed genes up-regulated in B. blakeana vs B. purpurea and B. variegata showed more specific bacterial and pathogen resistance, UV tolerance and drought avoidance. Using SNP parentage testing, a total of 79,302 SNPs were observed in 27 possible scenarios, in which 65,159 SNPs follow Mendelian law and yielded 82.17% in support of their parentage relationship. Raw data (see: GigaDB:100245) and RNA-extraction protocols (see: DOI:10.17504/protocols.io.gsnbwde) have already been published, and included here are the transcriptome assemblies, annotations and SNPs, along with other materials and results supporting this research. For more information see Buahinia Project pages. Displaying 1-4 of 4 Sample(s).